Two government soldiers were killed and six others injured on Friday after a suicide bomber attacked a military near Afgoye, a police offical confirmed. “Yes, one of our bases was just hit by a suicide attacker. He was not able to penetrate the compound,” Major Mohamed Ahmed, a police officer told Xamarpost by phone. The officer added that that Toyota Noah – a conspicious seven or eight-seater MPV that is frequently converted by Al-Shabaab to a VBIED – was used in the attack. The military base is located near Afogye, just 30km (20 miles) northwest of Mogadishu. The troops stationed there are trained by the United Arab Emirates. While declining to give any details, Al-Shabaab has claimed responsibility for the attack. 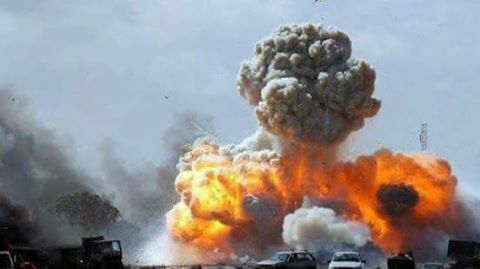 The group’s military spokesman, Abdiasis Abu Musab said “There are many casualties. We shall give details later”. In a separate incident, the group killed five Kenyan police officers and injured three others during a raid on two security camps in Northeastern Kenya. There are also unconfirmed reports that Al-Shabaab has retaken control of Balad, a strategic town about 37 km north of Mogadishu that borders Afgoye, after overpowering the local police station. Al-Qaeda backed Al-Shabaab has been waging a ‘holy war’ against Somalia’s internationally-backed government for over a decade. The attack comes when the nation’s president, Mohamed Abdullahi Farmajo is in Kampala attending a high-level security meeting with AMISOM’s troop-contributing countries to discuss how to defeat the militant insurgency group.